Have you ever had a craving for something so strong that it creeps into your mind at every 'hungry' opportunity? I've been walking around with visions of me tucking into scrumptious steamed cakes laden with bits of Lap Cheong (Chinese Sausage). After weeks of torment, I finally decided to put the matter to rest! I took to the kitchen, slamming cabinet doors along the way as I gathered the necessary ingredients. 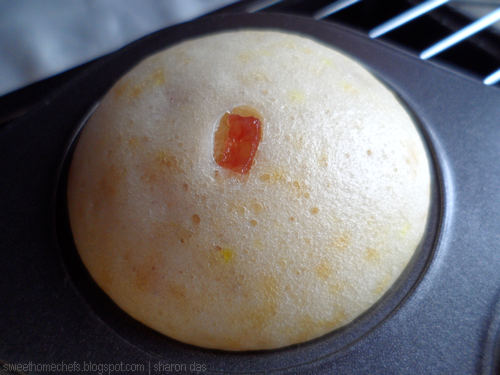 Soon, Steamed Lap Cheong Cakes were born. I held one warm luscious cake in hand. The first bite I took was so satisfying that I felt an overwhelming desire to give myself a big hug! This is what it looks like fresh out of the steamer. 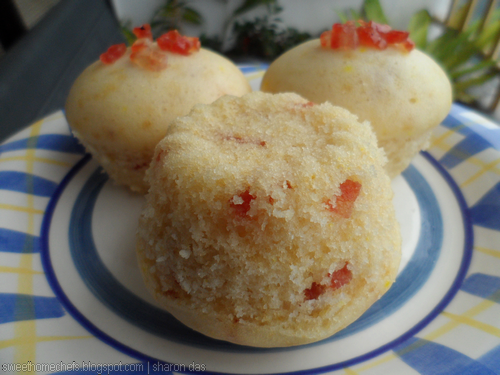 For the cake recipe, head on to Piggy's Cooking Journal at http://www.piggyscookingjournal.com/2007/09/steamed-cake.html . These are the changes I made. I replaced olive oil with corn oil. Instead of sesame seeds or pine nuts, I added lap cheong that I had sliced into small bits. Quantity used: 1 regular tube of lap cheong (about 6in long) was sufficient. An inch out of it was kept aside and used as topping. 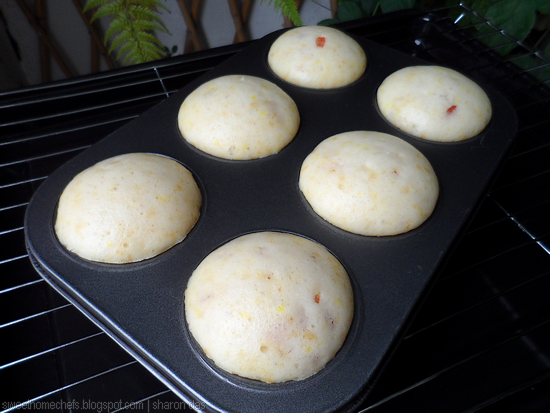 This recipe produces 6 regular cupcake-sized cakes, which is great because these are best eaten when it's fresh and warm. Although taste-wise it remains great the next day, the texture of the cake is less than satisfying even after re-heating. 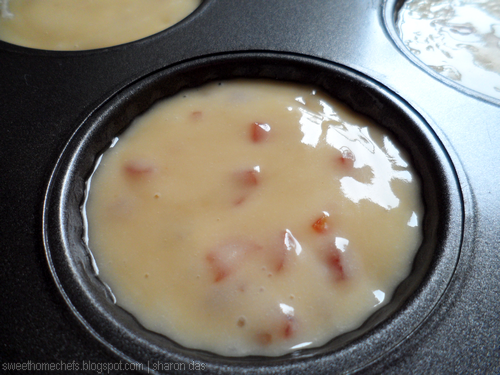 Below is a photo of the batter, already mixed with lap cheong bits and spooned into the cake mould. I used a toothpick to test if the cakes were done. It was and took only 15 minutes in a pre-heated steamer. The cakes were soft, yet bouncy to the touch, much like babies' cheeks. A close-up shot I took whilst waiting for the cakes to cool a little. As soon as I could, I eased one cake out and started eating. Before I knew it, I had finished two. My thoughts ran along, "Gosh, this is yummy..."
The verdict: Lap Cheong (Chinese Sausage) is one of the best ingredients I've ever added to a cake! 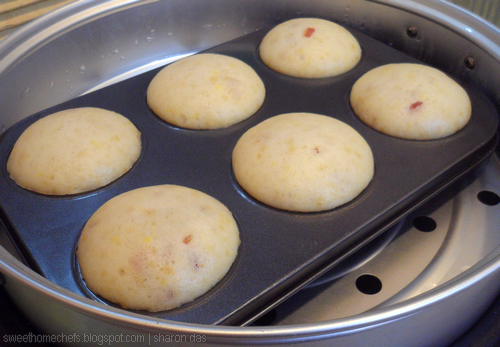 I love these are steamed instead of baked and it they have such a soft and moist crumb. Delish! 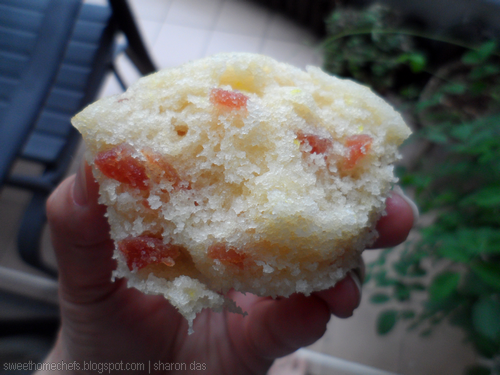 I have not had steamed cake for ages...and I love that you had them in cupcake size...the sure look light and fluffy...like the savory touch! Oh, you're making me hungry! Despite the fact that I have been feasting on the bread I baked! I'm checking out the source now. Looks delicious! !